Is the CO hydrogenation reaction over supported nickel catalysts influenced by the strong metal support interaction? Sulphur poisoning of metals. "Model experiments on single crystals"
Metal-Support and Metal-Additive Effects in Catalysis, Volume 11, documents the proceedings of an international symposium organized by the Institut de Recherches sur la Catalyse - CNRS – Villeurbanne and sponsored by the Centre National de la Recherche Scientifique, Ecully (Lyon), September 14-16, 1982. This volume contains 40 manuscripts that cover a wide range of topics. Among these are studies of metal-support interactions involving Pt/Al2O3, Pt/TiO2,Fe/TiO2, Pt/MgO, Rh /Al2O3, and Pt/CeO2 catalysts. There are also separate chapters dealing with ethane, n-butane, and cyclohexane hydrogenolysis; skeletal isomerization of methylpentanes; the catalytic activity and selectivity of noble metals; CO hydrogenation over supported on SiO2, Al2O3, Ti O2,and Zr O2 nickel catalysts; and the role of promoters in Pd catalysts for methanol synthesis. 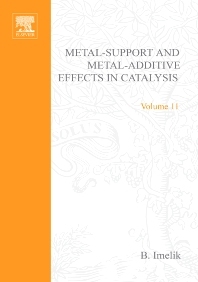 Subsequent chapters cover the poisoning of platinum and nickel by sulfur; C6H6 and CO chemisorption on Pt78Ni22 (111) single crystal alloy; the surface composition of industrial ammonia synthesis catalysts; and the role of alkalis and electronegative promoters on Fe and Ni catalysts.